Fit advisor works fine for me. And I also think the calculation of B, C etc and A1,A2,L1, etc by the fit advisor formulas, works fine. BUT when I change A, and hit "Calculate", none of these values will change. The only way to get new values for B,C, etc and A1,A2, L1, etc , is to uncheck B,C,D,E,F and then hit the "Calculate" button. This is not a huge problem. But it took me quite some time before I noticed. I think the manual should have warned me for this snag. In the screen capture below, the Calculate button features these arrows >> which are to indicate that all the values on the right are about to be calculated based on the body dimensions above (A, B, C, D, E, F). Ideally, one would enter measured values for each of the body dimensions. This will provide the most accurate representation of the unique proportions of the given rider. If you do uncheck any of the boxes from A to F, BikeCAD will approximate values for you. This is explained at the 1:40 minute mark in the video posted at: bikecad.ca/fit_advisor. 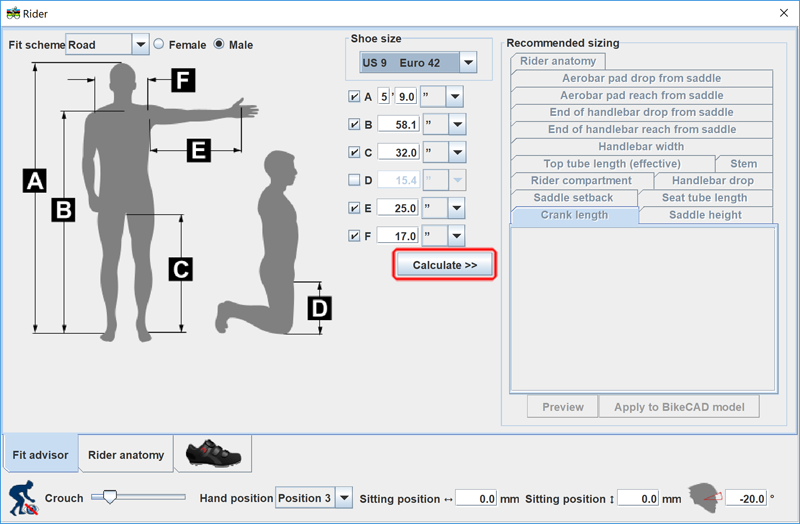 Because the more detailed dimensions in the Rider anatomy tab can be difficult and time consuming to measure, BikeCAD will approximate values for those, but it only applies those approximate values when you click the "Apply to BikeCAD model".